I'm 6'1 205 lbs currently ride a 5'6" 2014 koal fish. I am looking for a skim style board for someone 200+ lbs. Anyone have a recommendation? I would like something easy to spin on water, my main concern is the board being too slow and difficult to stay in the wave. I ride behind a 2017 LSV. Thanks for any input, there are so many options available now it is overwhelming trying to figure out what would be a good fit. i bet @isellacuras would let you have a go with his in exchange for a pull. Any time @Fman. I like riding the captain more than my soulcraft. It rides totally different but it's not slow. I highly recommend it. We have the 52" Butter Bar XR. It's a great board for what you are describing. I'm 6 ft and 200 on a good day. You are welcome to ride it any time if you make a trip up to Chico. You could also see the american floor mat in person. Everyone that has been on my boat with the new mat comments every time how much they like it. Victoria is a great great board! I have a Factor & we love it. HOWEVER, I recently picked up a Connelly Katana which is surf style, but I can skim better on it then I can skim on my skim boards (we have the Hi Fi & the Victoria Factor). First time out on it I landed a 360 for the first time, I can effortlessly do transfers now to either side. I can do backside 180's now but riding them out & bringing them back still needs work. Another plus for the victoria... I did ride a Tuk Tuk last week and it surprised me as it was a 4 ft board (it was the only demo he had at the time, I think I would choose a 4 2 or 4 4 )and still had plenty of push and speed. I am below your weight, but my friend rode it with no issues either and he is around your weight. I am debating between the Tuk Tuk skim for my next purchase or one of his longboards. It would be better if you could demo them as there many different boards out there and not all riders like the same board. Me too. love how greasy the victoria is. The SC is fun for speed and (baby) airs, but I can basically do everything on the vic that I can do on the SC, with the vic being a little more challenging b/c of the looseness. The Captain looks like a larger version of our Agent. We love that board. Durable too. Haven’t ridden one but the Jake Caster brigade looks pretty awesome. Also a lot of guys riding phase 5 stuff. Until it flies out of the bow and hits the windshield. Anybody ride the Brigade asymmetric? Seems like a good idea. Yes!! Love it , really have to play with fins, I run with 3.5’s-.7? And one nub in the outer asym slot, to make it loose enough for a small boat wave. First rode it at surfest 2017 Lanier . Bigger boats bigger fins 4.25-4.75 outer with nub and a 3.5-3.75 inner fin. This Board is probably better for airs and high level complete 360’s. my style diff hence the smaller fins to loosen it up. The looooong pointed nose makes pearling the nose almost impossible. Therefore when you come scrambling off the wave from a maneuver , your recovery doesn’t really involve swooping the nose to make sure you don’t dunk, the water rushes over it snd it emerges with you surfing. I ride it toes and heels goofy and it’s awesome . Love it for heal and toe Board slides. Surfs my foam ball better than any board I have ever tried because length allows more front foot pressure and keeps me hovering in same spot whether I slash or grind . want to stay back , no problem wait until your ready and lean forward. While yourback there you pump once , wait , maybe another pump. Big boards this light do amazing things. Now let’s talk durability , forget it , but since his boards are white where they ding, easier to repair and not look ugly. it’s no phase five but that’s not what Shaun does. My biggest issue is it came with a brigade logo nuff grip underpayment that had a perfection nuff grip clear wax pad one piece that didn’t wear out, it kept coming loose . Shaun said just get best temp wax bar and judiciously put it on the logo underpayment which it was intended for . He’s right cause it’s glued on, tried nuff grip replacements and they are terrible in hot water and weather trying Viskus next , you could use EVA. 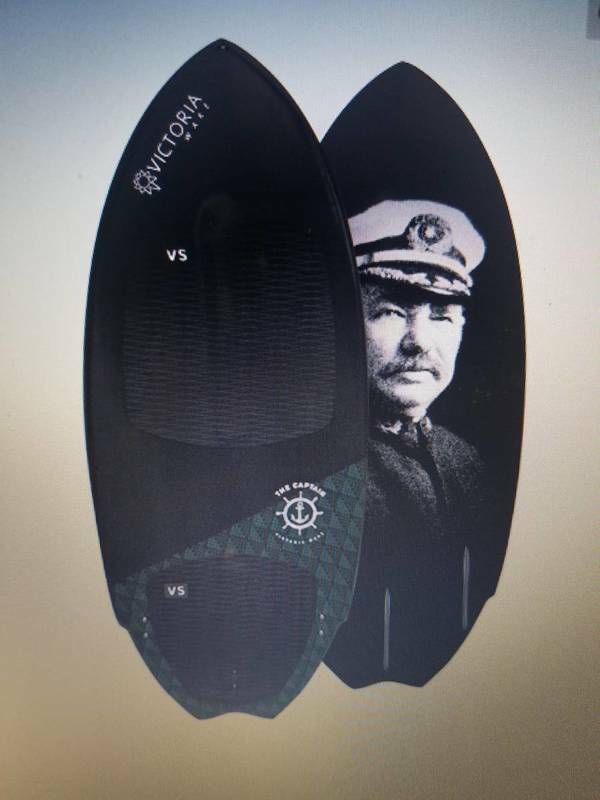 mine was designed differently and may have been a beta board at the time, I have two points in rear closer together than his new design with a concave on asym angle 1/2 circle . Now it’s a straight edge across. Probably a much easier shaping design decision , the other design didn’t translate to the small size either. Also one thing, brigade as with this board is a true offshore style top construction where you have a convex top leading to a thinner well contoured surf rail. So it’s a big slope from center to edge. My first encounter with brigades and that convex shape was not good , didn’t like it felt awkward . But that was a much smaller width Board and therefore more curvature . Now I like that because it’s how you apply efficiently with ankle and feet movements to affect the rail , is more accurate and controlled than a convex top Board . My style likes that application, I just didn’t know how to do it originally. @isellacuras is kindly letting me use his Victoria Captain tomorrow. I should be able to get a couple good sets with it. Looking forward to riding it, all reviews I have found on it look like its zactly what I am looking for! graphics look pretty sick too! @granddaddy55glad you had a good experience with Brigade! Unfortunately Mine was the polar opposite. Waited a year for my board and definitely not what i hoped for or expected. Funny I rode a brigade bravo last week and had a very hard time staying in the wave. I felt like I was on the gas hard the entire ride. That being said my son really liked it... I thought it was fun to ride just a lot of work staying in the wave. Exactly! Ordered a custom Halfie-pro and had trouble staying in the wave! Thought maybe it was me so I tried a bunch of times and still no different! Buddy of mine had a Soulcraft Super AV so I tried that to compare and easy-peasy no work at all to stay in the wave. I then gave the Brigade to a friend who is an instructor and has been surfing for years...no bueno, said he never had to work so hard to enjoy the wave! Live and learn, no more Brigades for me. I do love the SC though! In fact to my surprise I pulled my first 360 on that board!! Glad you liked it. Yeah, my soulcraft is not for everyone. It is yuge and made for me. @isellacurasFunny thing about the VooDoo was I was constantly on the brakes! My back leg was actually feeling it... first time that has ever happened its kinda crazy how each board rides so different. Very similar to the factor but just a bit larger (wider). If i remember correctly, the captain was introduced after the XXL factor was discontinued. I had to work to keep the XL factor going but the captain supports my weight better. Yea that is legit. nice! Thanks for the link! Just ordered an "art blem", 2018 model for a steal! I ride the phase 5 trident and love it but couldn't resist purchasing the Captain at a heavy discount. I had heard great things about the Captain XL for bigger riders and had been searching for a used one for a while now. I just couldn't pull the trigger for a new one at retail price for another board without a water test.